Homemade cherry brownies served with a scoop of ice cream, cherry pie filling and hot fudge sauce. ice cream, cherry pie filling (leftover from making the cherry brownies) and hot fudge sauce (click link for my easy 3 ingredient homemade hot fudge sauce) and you have a dessert to please valentines of all sizes, big or small. The brownies didn't turn out as pink as I had wanted them to, but they were so moist and the cherry flavor was there so I was happy with them. You could always use a drop or two of red food coloring if you want a little more of a pink color. I am not a fan of food coloring and do not use it unless it is necessary for a birthday or special occasion cake. 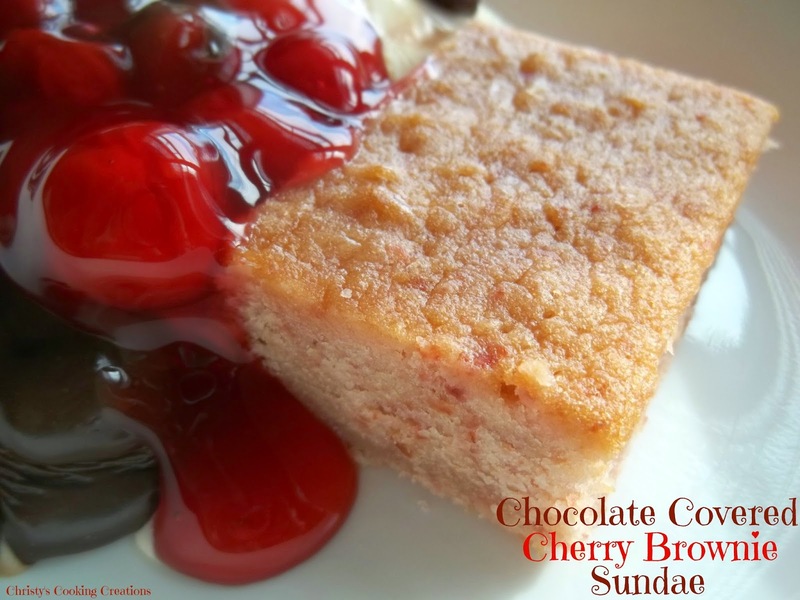 The sundaes were absolutely divine and definitely reminiscent of a chocolate covered cherry, but you could easily just top the brownies with a vanilla or cherry frosting and have a different but still scrumptious dessert. 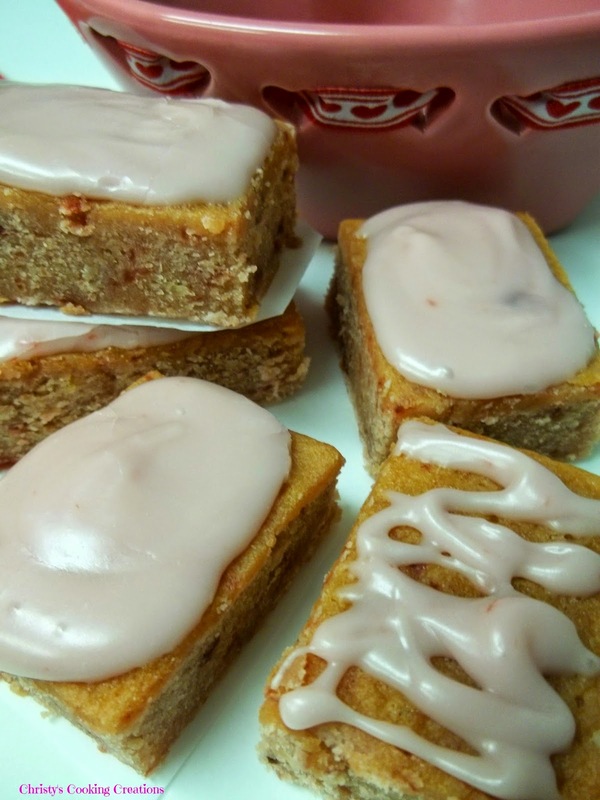 I took a few and frosted them with a cherry frosting I quickly whipped up with a half cup powdered sugar, one tablespoon of the filling juice (no cherries), one teaspoon of milk and a half teaspoon of almond extract (vanilla extract can be substituted but I recommend the almond). You may want to double this if frosting the entire pan of brownies. Frosted brownies or brownie sundaes, you really can't go wrong. You won't be disappointed with either. Which will you choose? Line an 8X8 baking pan (I used a glass pan) with foil, leaving overhang to pull brownies from pan. Lightly spray with cooking spray. Mix flour and pinch of salt; set aside. Melt butter in microwave safe bowl big enough to mix brownies. Allow butter to cool slightly. Add sugar, cherry filling puree, extract and eggs to melted butter; whisk to combine. Whisk in flour and salt mixture until no dry streaks remain. Pour into 8X8 pan and bake for 25 minutes. Allow brownies to cool before removing from pan, cool completely before slicing. Place brownie in bowl with ice cream of choice, top with cherry pie filling and hot fudge sauce. *Note: The almond extract is preferred, it lends itself more to the cherry flavor! ©Christy’s Cooking Creations. Please do not use my images without prior consent. Please link back to this post even if recreating and posting this recipe in your own words. This looks delicious. I've pinned this to put it on my must make list. I found your link at Teach Me Tuesday. Thank you Beverly, it is a fabulous treat. Thank you for pinning! These look wonderful! :) Yum.. Thank you, they are yummy! This looks like some serious deliciousness! So excited to see it at #FoodieFriDIY! Sharing! Hi Michelle, thank you :) Love sharing and finding great new things at #FoodieFriDIY, always an awesome party! This looks really delicious....can't wait to try it out. Oh my goodness, yummm. I invite you to share at my Thursday hop ( you can link up through Sat midnight) Hugs! Hi Katherine, I am definitely going to checkout your party. Have a great weekend! What a yummy treat, cherries and chocolate are a great match!! Thanks for bringing such a lovely recipe to share on Friday Features! Oh My!! These look so amazing!! Thanks for sharing on My 2 Favorite Things on Thursday!! I have Pinned this too!! Don't forget to come back next week and share some more!! I love having you! This is such a unique way to do brownies and both the frosted ones and the Sundae look so yummy! Thank you for sharing on the Merry Monday link party. Have a wonderful week! Thanks Kimberly, always enjoy the party at Lou Lou Girls! How delicious! These pictures are good enough to each. I love almond extract. It smells good and gives it a distinct flavor. Pinning and sharing! Thanks for linking this up to Totally Terrific Tuesday last week. I can't wait to see what you have this week! Party goes live tonight at 9pm CST! Thanks Sharon! 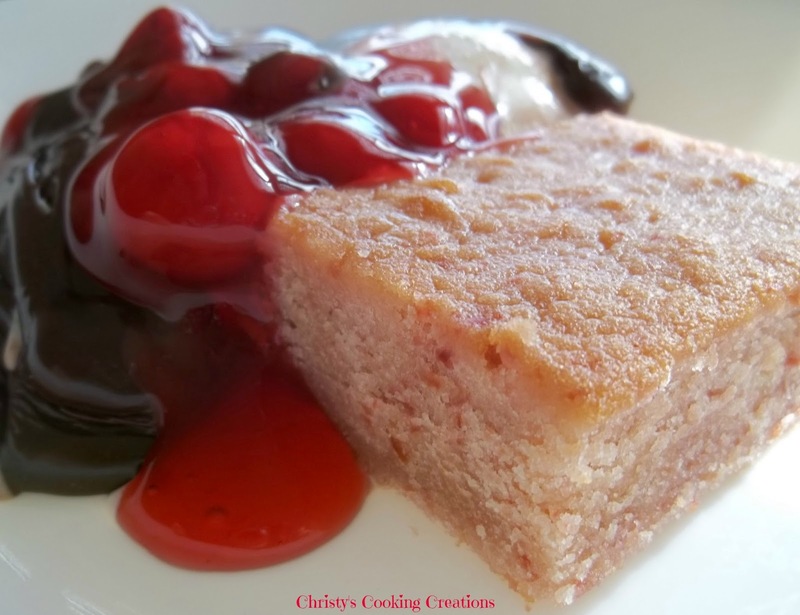 I love almond extract too and it pairs so well with the cherries! Thank you for hosting Totally Terrific Tuesday! What a delicious dessert! Thank you so much for attending week 19 of #PureBlogLove and linking your fantastic blog post, I can't wait to see what you have in store for our next party, Thursday 8 PM EST- Sundays at midnight. Your post has been added to the #PureBlogLove Pinterest board for all to see :) Have a great day! Hi Nicole, it was quite decadent and delicious, I enjoyed my fair share :) Thanks for pinning and for hosting Pure Blog Love! Love this! I've never ever considered doing a cherry brownie before. I bet this would be so divine with white chocolate added! Maybe macadamias? Mmmm. Love the look of those brownies, such a great idea making a sundae out of them. Thanks for linking up to Sweet and Savoury Sunday, stop by and link up again. Have a great day!! Hi, I'm Christy. Recipe creator, cookbook reader, kitchen gadget collector, work in progress photographer and food blogger. Drinker of copious amounts of coffee and iced tea. Content to be constantly covered in a swirl of sugar and flour. Delighted that you took the time to stop by. Ecstatic if you stay and visit. Thrilled if you find a recipe here you want to recreate!